Beginning in 2013, a mysterious disease crippled sea star populations up and down the U.S. west coast. 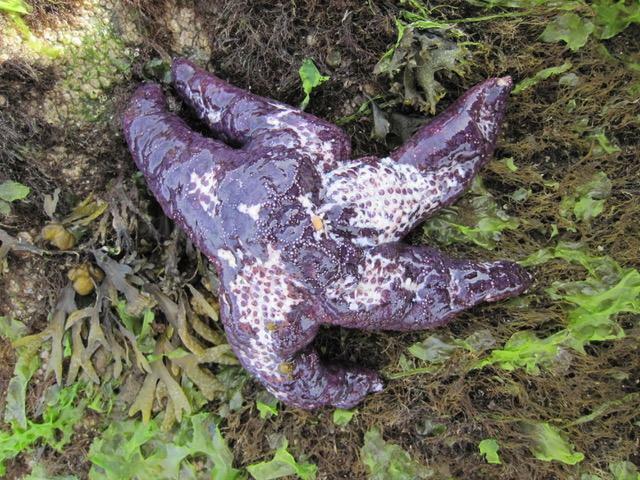 Over a matter of months, many sea star species died in record-breaking numbers, though Pisaster ochraceus–a keystone species known as the ochre sea star–was among the hardest hit. Now, researchers at UC Santa Cruz have analyzed just how much the populations of this species have declined, but they have not yet determined what factors might be contributing to the epidemic. Scientists aren't sure what causes this disease, known as sea star wasting syndrome (SSWS). Some researchers think the culprit could be a viral pathogen, but evidence is inconclusive. Early signs of SSWS include lesions and tissue decay, which can spread along the sea stars' arms, leading to limb loss and eventual death, often in a matter of days. Melissa Miner, a researcher in the Department of Ecology and Evolutionary Biology at UC Santa Cruz who is based in Bellingham, Washington, recounted that she had been observing sea stars in a local intertidal zone there during the summer of 2014. "I went back two weeks later, and it was just death," she said. "The intertidal area was littered with stars, and probably 90 percent of them were dead or dying." While similar SSWS outbreaks were documented in southern California in the 1970s, '80s, and '90s, this most recent epidemic is unprecedented in its scale and scope. "We've been monitoring sea star populations for a long time, but this event is far broader in geographic scale than anything we've seen before," Miner said. This latest outbreak extended from as far south as Baja California, Mexico, all the way to the southern shores of Alaska, according to Peter Raimondi, professor of ecology and evolutionary biology and director of UCSC's Institute of Marine Sciences. Raimondi is a principle investigator for the Multi-Agency Rocky Intertidal Network, or MARINe, a consortium of 18 research groups that monitor and collect data from more than 200 intertidal sites along the west coast. In a new study published March 20 in PLOS ONE, Miner, Raimondi, and colleagues analyzed MARINe data collected between 2000 and 2016 from 90 intertidal sites on the North American Pacific coast to determine the impacts of SSWS on ochre sea star populations and try to understand what factors may have contributed to this most recent SSWS outbreak. The data revealed that, while ochre sea star populations shrank in all coastal areas, sites in southern California and the Channel Islands experienced more severe declines than those farther north. In the south, adult sea stars declined by 99 percent or more at over half of the 39 sites surveyed, whereas only 2 sites in the north experienced similar levels of decline. Miner's group also noted that juvenile sea star mortality in the period after the initial outbreak of SSWS increased by approximately 90 percent compared to pre-outbreak levels. Ochre sea stars are keystone predators in intertidal ecosystems–the part of the shore area submerged at high tide and uncovered at low tide–preying on organisms like the California mussel. When ochre stars are removed, mussel beds can expand, leaving less space for other organisms to flourish in those habitats. A decline in ochre sea stars could lead to a change in the make-up of intertidal communities on the west coast, although other factors are also at play, Miner said. Unfortunately, the data didn't yield any clues about which factors might be contributing to SSWS in these different regions. A common culprit in many marine disease events is warm water. Past SSWS events were often correlated with El Niño events and their associated periods of warm water, but that was not the case with the 2013 outbreak. According to Miner, elevated sea water temperatures weren't linked to the initial emergence of the disease on a broad scale, but may have exacerbated its impact in the period that followed. Another factor that researchers consider when trying to predict the spread of a disease is the density of the affected populations in different areas. "In areas where animals are packed closer together, it's generally more likely a disease will spread," Miner said. But her group didn't see that pattern for ochre sea stars. In fact, the outer coast of Washington–one of the regions with some of the highest densities of stars–was among the least impacted by SSWS. Because scientists haven't found any "smoking guns" behind the disease, and factors that frequently influence the emergence and severity of marine disease events, like temperature and population density, did not correlate with this outbreak, it is difficult to address the epidemic, Miner said. "Without information to support or discount certain environmental factors, we can't even begin to prescribe potential solutions," she said. According to Miner, the epidemic that started in late 2013 is still ongoing, though the major population crashes noted in 2014 and 2015 have since leveled off. "I'd want to see current population levels persist for another six months or so before saying this disease event is over," she said. Miner is now looking to the future. She thinks that prospects for ochre sea star population recovery are uncertain. If current trends hold, however, recovery will occur fastest in northern regions, where more juveniles are recruiting and appear to be surviving to adulthood following the disease outbreak. "My guess is southern California regions will take a lot longer to recover," she said.